Today we’re back in Rome for Part 2 of our adventure! 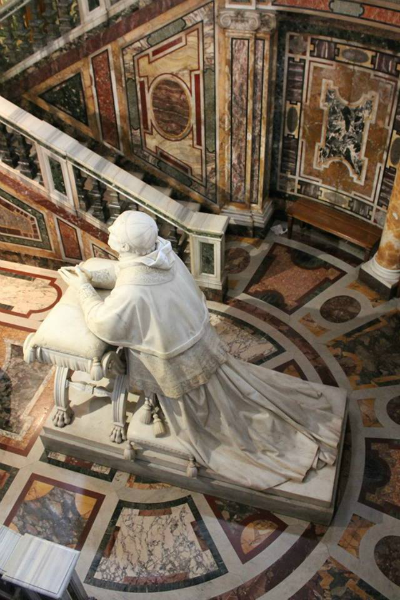 You can see Part 1 here and details on Vatican City are coming in a separate post. 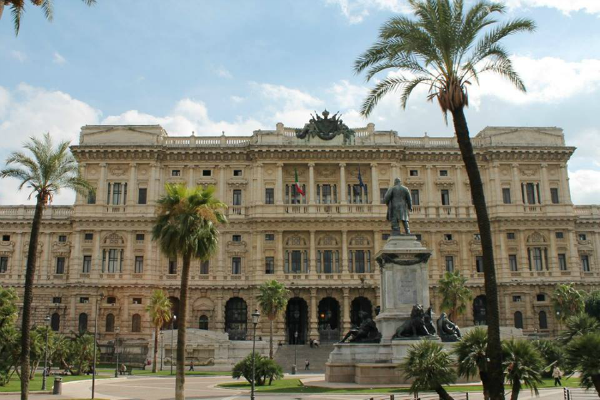 There’s just too much good stuff in Rome to pack it into one post! 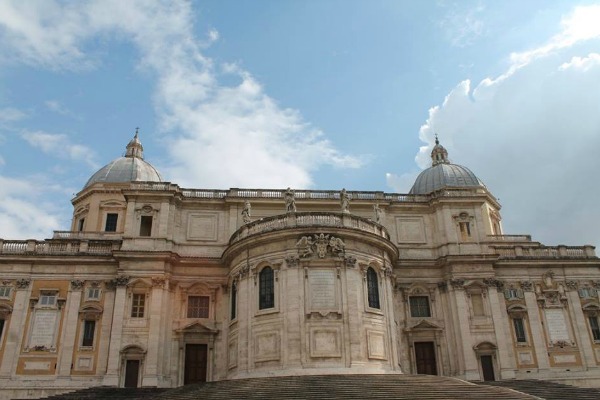 Let’s start at Basilica di Santa Maria Maggiore – one of the four major basilicas (the four highest-ranking Roman Catholic churches). We stopped here after spending the morning/early afternoon at the Vatican. I don’t think I’ll ever reach a point where I’m not completely impressed by all of the time and skill that goes into creating the interior of these churches. The mosaics, the statues, the art – everything down to the tiniest detail is impressive. We ended up spending quite a bit of time inside because it started raining while we were there…I can think of worse places to have to wait out a storm! The rain eventually stopped and we were close to our hotel, so we managed to stay dry that day. Although it probably wouldn’t have mattered because we didn’t go out again except at dinner to stuff ourselves with food, wine, and gelato. 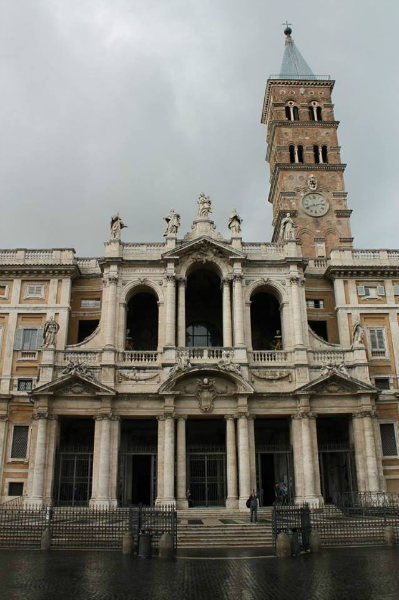 The following day was our last in Rome, so we decided to take the hop on/hop off bus tour around the city. There are multiple companies to choose from, but we went with City Sightseeing because there was a stop close to our hotel and they sold tickets in the lobby. 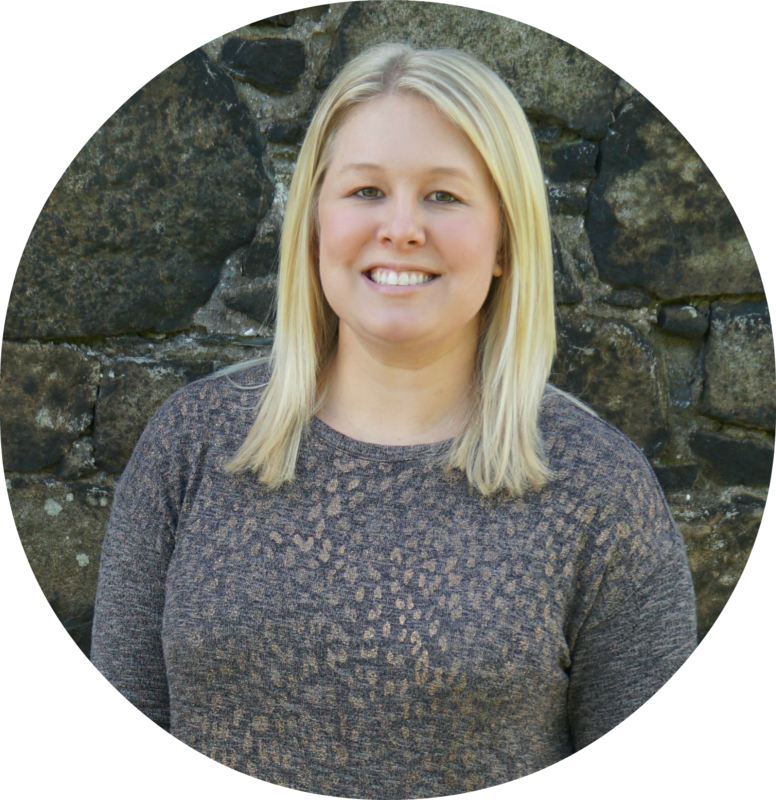 We were happy with our experience with them and it ended up being a fun way to get see the city. Plus it took us to one place we probably wouldn’t have stopped at on our own, but ended up being one of our favorite places of the whole trip – more details later! 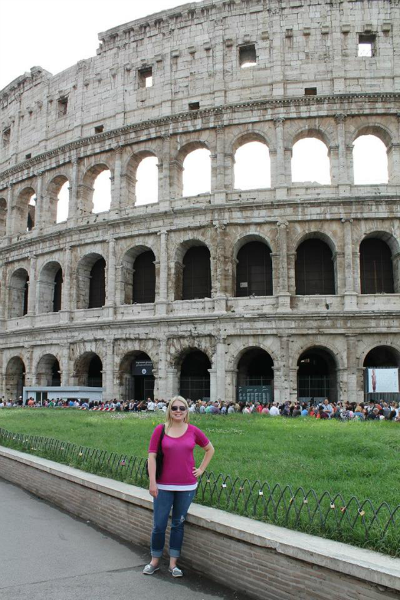 The first stop we hopped off at was the Colosseum. We had already been there with our tour group a couple days prior, but we wanted some extra time to check it out and take pictures on our own. 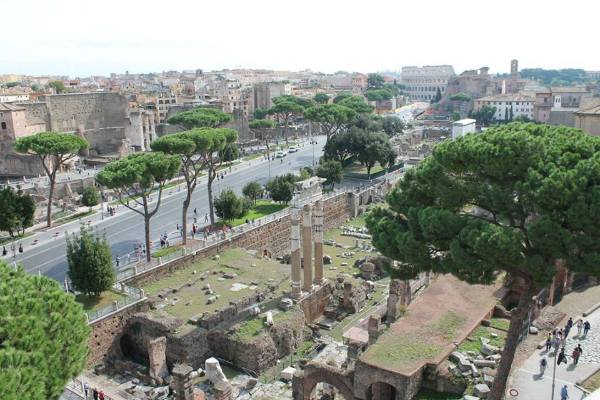 From there we walked down the Via dei Fori Imperiali and took more pictures of the Roman Forum that we had also seen a couple days before. Our first new stop of the day was Il Vittoriano (nickname: “the wedding cake”). 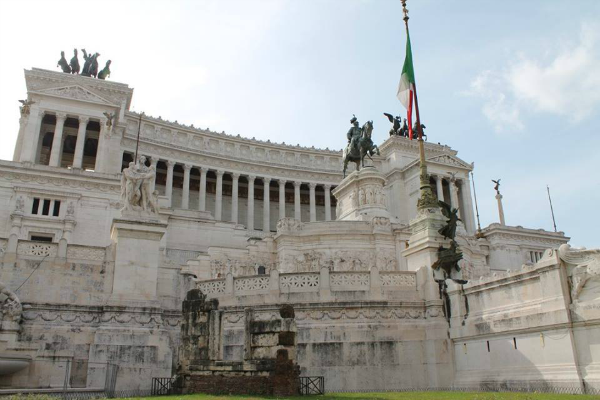 It’s a monument built to honor Victor Emmanuel, the first king of unified Italy. 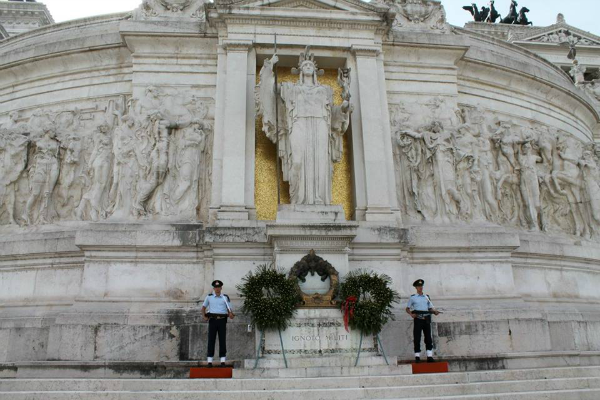 Up the first long set of steps is the Tomb of the Unknown Soldier, watched over by a statue of the goddess Roma. I highly recommend going inside and climbing the steps to the terrace. 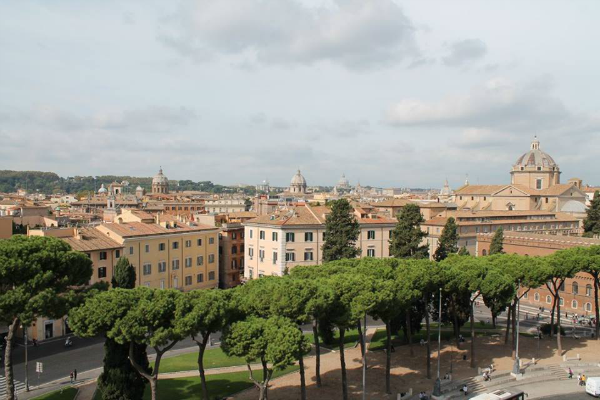 The view of Rome from there is absolutely beautiful. You can also pay a fee to take a lift to the very top of the building, but I decided to save my money and enjoy the amazing free views. 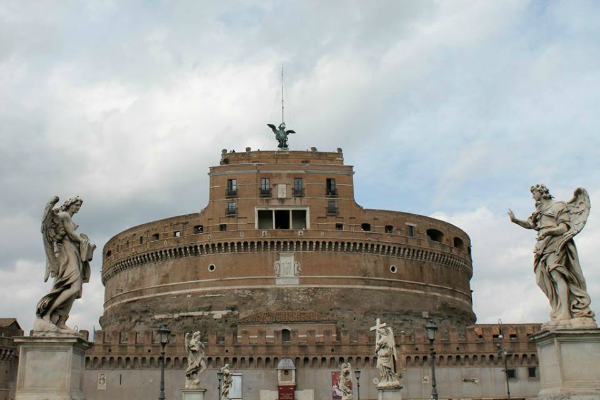 After that we hopped back on the bus and hopped off at the next stop to see Castel Sant’Angelo. Our original plans didn’t include this stop and we almost didn’t pay the fee to go in, but it ended up being one of our favorite spots of the trip! 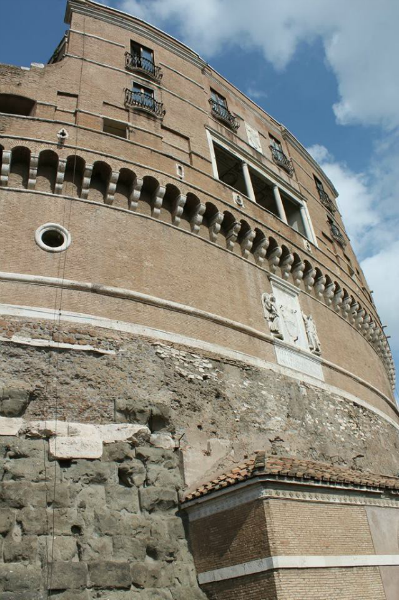 Castel Sant’Angelo was built in 123 A.D. by Emperor Hadrian as a monumental tomb for his family and himself. Because of its strategic position, it was later reinforced and used as a fortress for attacks against the city. There’s also a tunnel between the Vatican and the fortress that was used as an escape route by various popes over the centuries. 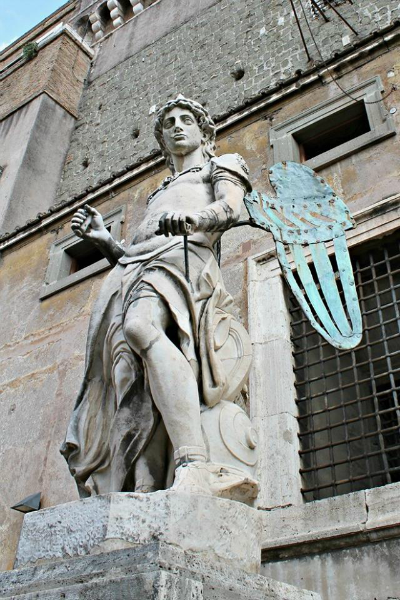 If you’ve seen Angels and Demons lately, you might recognize Castel Sant’Angelo as the Lair of the Illuminati from some of the final scenes of the movie. 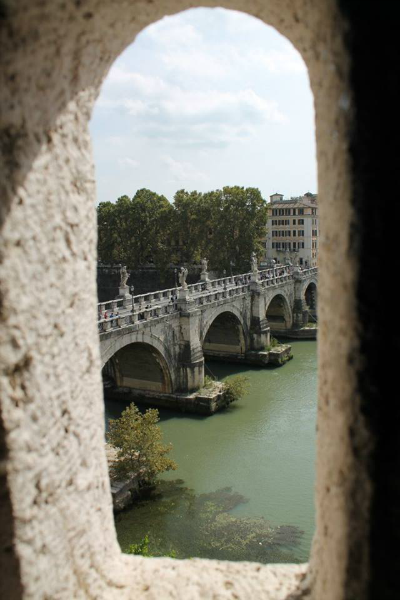 The views from Castel Sant’Angelo are pretty amazing. 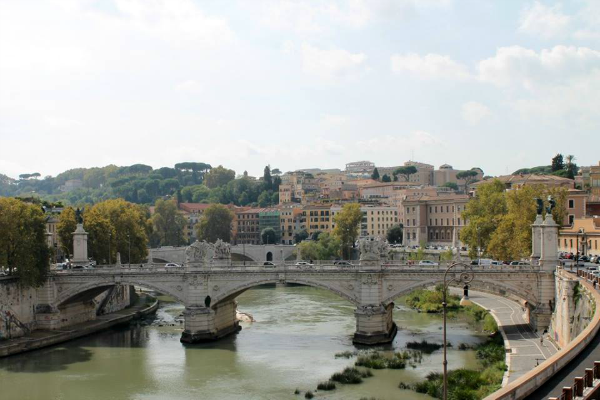 On one side you can see St. Peter’s Basilica and the Tiber River runs along the other side. After we finished exploring Castel Sant’Angelo we hopped back on the bus and rode it around the entire loop again so we could listen to the audio guide and enjoy the beautiful weather and see the sights for the last time. For our final night in Rome we had a big group dinner with everyone on our tour. 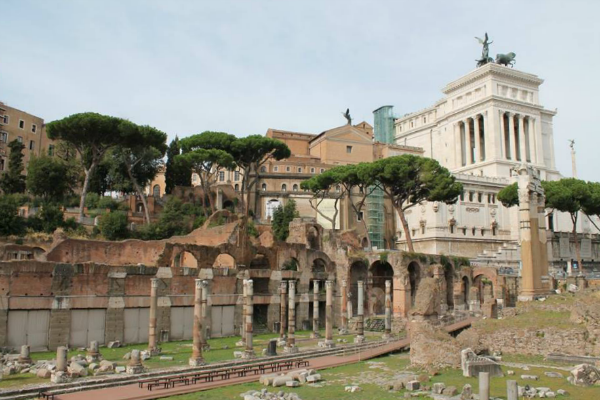 The main tour ended in Rome, so about half of our group would be leaving the following day. The rest of us had booked the optional tour extension and would be continuing south in the morning. There were a lot of hugs, e-mail addresses, and Facebook friend requests exchanged that night. It was a great way to end the main tour and our time in Rome. Our next stop: Sorrento! 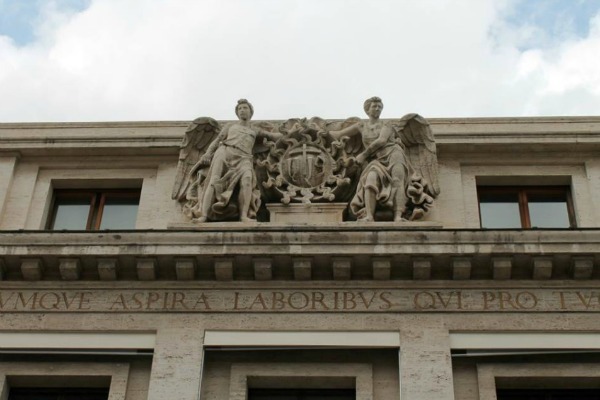 Ah Rome - what a place so full of history. I have some fond memories of the times I have spent there, both as a first time tourist to Italy and also as a resident of the country. 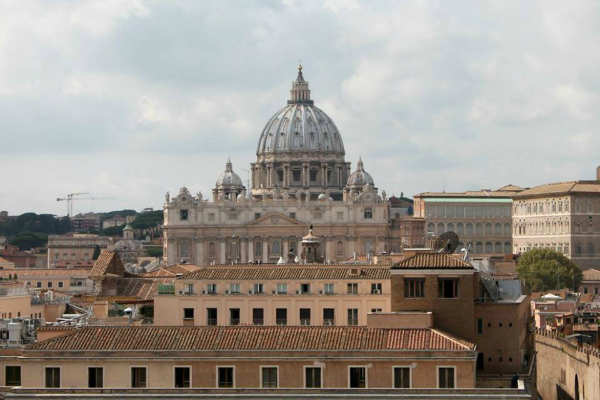 I've had two visits to Rome, one aged about 12 and one at 40. I need another fix, especially after reading your post. Such an extraordinary city.